Although some plumbing repairs require a professional plumber, you don’t need to call a plumber for a minor clog or leak. Before attempting to repair any plumbing problems, you must recognize when the job calls for a professional. Whether you decide to fix the plumbing problem yourself or hire a professional, there are some plumbing tools that every household should have. The following provides a list of the five most commonly used plumbing tools. Every homeowner will eventually have to deal with a toilet that will not flush, a leaky sink, or water that won’t turn off. One of the best ways of dealing with this problem is to always have repair kits on hand. You can purchase a simple toilet repair kit at most hardware stores. A toilet repair kit will generally include the basic parts needed to repair a toilet. Sink repair kits normally contain nuts, washers, and bolts. Some sink repair kits will also have a stem for the handle. Washers, bolts, and nuts are very inexpensive, and it only makes sense to have some on hand should you have to make any minor plumbing adjustments. A clogged drain is one of the most common plumbing problems. It is also relatively easy to fix, but you must have a good plunger. There are a variety of plungers available at your local hardware store, but a toilet plunger is the most versatile and highly recommended for the average home. 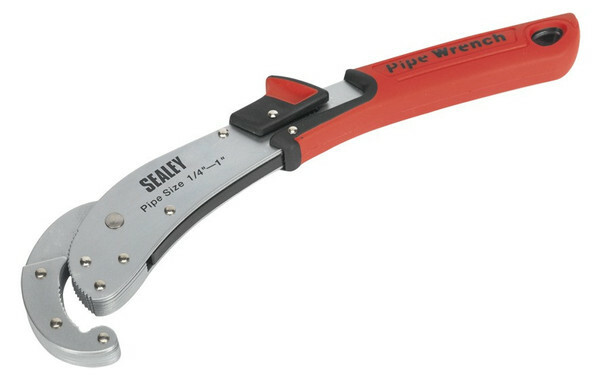 Pipe wrenches are ideal for gripping pipes, and adjustable pipe wrenches provide versatility. Adjustable pipe wrenches are used on various size pipes. Every home should have at least two pipe wrenches, one for holding the pipe steady and the other for unscrewing. Pliers are also great for holding pipes in place should you not want to go out and purchase an adjustable pipe wrench. Most types of clogs that occur in showers, tubs, or sinks can often be eliminated with a drain snake. A drain snake is a long metal wire that has a loop handle with segregated edges on the end of it. A drain snake allows you to clear out your drain quickly and efficiently. Always try to pull the clogged matter towards you and not break it up and push it down the pipe. If you have a plumbing leak, you might not know how to fix it other than turning the water off. There is a great possibility that you may not have the necessary tools nor the knowledge to properly fix the leak. Plumbers putty is a great temporary fix for any plumbing leak. This should work until a professional plumber arrives. Simply push the putty into the area that’s leaking. You may also want to test it to confirm that the leak has temporarily subsided. After you have confirmed that the leak no longer exist, you can continue to run the water for the next day or two. Repair kits, a toilet plunger, an adjustable pipe wrench, a drain snake, and plumbers putty are some basic tools that every home should have in the event of an emergency or to solve basic plumbing problems. If you have these items readily available, you can save yourself a lot of money and time for years to come.